The global agricultural adjuvants market is expected to register significant growth due to increasing need for better chemicals and methods for crop protection. The demand will be further fuelled by increasing demand for food products and shortened supply of farmland. The market also faces various constraints between 2016 and 2024. Genetically modified seeds are expected to be more pest resilient and deliver much higher yields. Moreover, price instability in the agricultural adjuvants market also poses a challenge to the long term prospects of the market. The global agricultural adjuvants market was evaluated at US$2.36 bn in 2015. The market is expected to total US$4.16 bn by 2024. It is expected to register a healthy CAGR of 6.6% during the forecast period of 2016–2024. The total volume in the global agricultural adjuvants market stood at 757,570 kilo tons in 2015. The global agricultural adjuvants market is divided based on application into herbicides, fungicides, insecticides, and a number of sub-categories in crop protection such as disinfectants, defoliants, desiccants, biocides, plant regulators, fertilizers, micronutrients, bio-stimulants. Among these, the crop control and pest control segment in the form of herbicides, insecticides, and fungicides led the market growth. Herbicides segment led the global agricultural adjuvants market in 2015 with a 45% share of the total demand. Increasing awareness among farmers about the key benefits of adjuvants and the increasing number of pests and rising food diseases are expected to drive the agricultural adjuvants market. 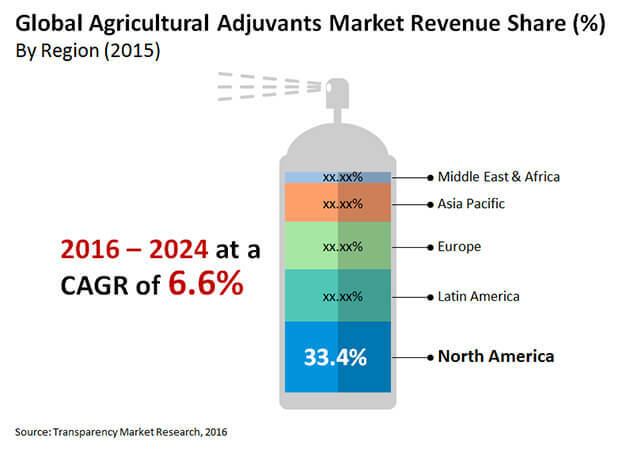 The global agricultural adjuvants market is segmented by geography into North America, Europe, Asia Pacific, Latin America, and the Middle East and Africa. The market is witnessing optimistic growth in North America and Latin America. Large awareness about modern agricultural methods, establishment of large-scale agriculture, and rising demand for food products are driving the demand in North America. The agricultural adjuvants market in North America is also expected to face some restraints in the near future. Tightening regulations in relation to dumping of chemical waste and their use by Environmental Protection Agency (EPA) are expected to pose a challenge to the market. The agricultural adjuvants market in Europe is dependent on the key cash crops of the region, such as sugarcane and oilseeds. The Europe agricultural adjuvants market is largely driven by the demand for certain crops for their use in multiple industrial purposes, feedstock, and raw materials fuels. The growth rate of this regional market is, however, very slow due to maturation of demand. On the other hand, the agricultural adjuvants market in Asia Pacific is continuing to show bright opportunities for the future. The main companies in the global agricultural adjuvants market are Croda International Plc., Akzo Nobel N.V, Clariant, Momentive Performance Materials Inc., Solvay S.A., Dow Corning Corporation, Brandt Consolidated, Inc., Loveland Products, Inc. This report analyzes and forecasts the market for Agricultural adjuvants at the global and regional level. The market has been forecast based on volume (tons) and revenue (US$ Mn) from 2016 to 2024. The study includes drivers and restraints of the global Agricultural adjuvants market. It also covers the impact of these drivers and restraints on demand for Agricultural adjuvants during the forecast period. The report also highlights opportunities in the Agricultural adjuvants market at the global and regional level. The report comprises a detailed value chain analysis, which provides a comprehensive view of the global agricultural adjuvants market. Porter’s Five Forces model for the agricultural adjuvants market has also been included to help understand the competitive landscape in the market. The study encompasses market attractiveness analysis, wherein end-users are benchmarked based on their market size, growth rate, and general attractiveness. The study provides a decisive view of the global agricultural adjuvants market by segmenting it in terms of type, and application. These segments have been analyzed based on present and future trends. Regional segmentation includes the current and forecast demand for agricultural adjuvants in North America, Europe, Asia Pacific, Latin America, and Middle East & Africa. The report also covers demand for individual end-user segments in all the regions. The study includes profiles of major companies operating in the global agricultural adjuvants market. Key players operating in the agricultural adjuvants market include The Dow Chemical Company, Royal Dutch Shell Plc, Kumho P&B, Lee Chang Yung Chemical, Celanese Corporation, Eastman Chemical Company, Mitsubishi Chemical Holdings Corporation, Mitsui Chemicals, Inc., and Others. Market players have been profiled in terms of attributes such as company overview, financial overview, business strategies, recent developments, and SWOT analysis. The report provides the estimated market size of Agricultural adjuvants for 2015 and forecast for the next nine years. The global market size of agricultural adjuvants has been provided in terms of volume and revenue. Market numbers have been estimated based on key application, and end-user segments of agricultural adjuvants. Market size and forecast for each major application, and type have been provided in terms of global and regional markets. Secondary research sources that are typically referred to include, but are not limited to company websites, annual reports, financial reports, broker reports, investor presentations, and SEC filings, internal and external proprietary databases, and relevant patent and regulatory databases, national government documents, statistical databases, and market reports, news articles, press releases, and webcasts specific to companies operating in the market, ISAA, United State Environmental Protection Agency (EPA), Agro news magazine, Chemical World Magazine. Company Annual Reports. Primary research involves e-mail interactions, telephonic interviews, and face-to-face interviews for each market, category, segment, and sub-segment across geographies. We conduct primary interviews on an ongoing basis with industry participants and commentators in order to validate the data and analysis. Primary interviews provide firsthand information on market size, market trends, growth trends, competitive landscape, and outlook, etc. These help validate and strengthen secondary research findings. These also help develop the analysis team’s expertise and market understanding.